A simple 9-patch quilt block has been the basis for many of my baby quilts, but this is the first one I've made larger into a twin size quilt. 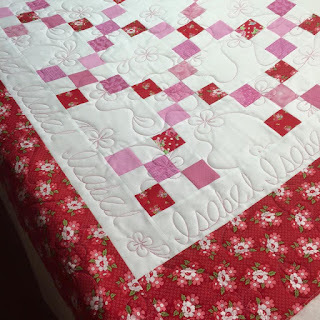 First choice was the pretty retro looking red floral used in the border. Then a selection of pink and red fabrics that were the same shades as in the border fabric. I cut a selection of 2.5" squares from the pinks and reds and a bunch from white Kona cotton and pieced my 9-patches. Next step is putting them up on the design wall and making sure that I didn't get too many of the same fabrics bunched together. 6.5" white Kona cotton squares were added as alternate blocks, blocks were sewn into rows, rows together into the centre of the quilt. A plain white border was added and then the cute red & pink floral. Marie from Blueberry Hill Quilts did the quilting and added the name of the quilt's recipient into the white border. We've done that for a few twin quilts - a nice subtle way to personalize a quilt.